Tire chains sold in pairs (2 chains), will cover two tires. Farmers and landowners know that the work doesn’t stop just because of bad weather. The deep treads on ag lug tires can get you through most things but even the heaviest tires can struggle on packed snow and ice. That is where our tractor chains can make all the difference. When clearance is an issue and excellent traction is needed. For tractors only. Will not fit a skid steer! Studded cross chains made from specially designed alloy steel. For tractors only. Will not fit a skid steer! Designed for both ice and mud. Their self-cleaning rings make it perfectly designed for mud use. Cross chains H design help the chains ride on top of the lugs rather than failing between. Designed for use on harder surfaces for greater speeds. 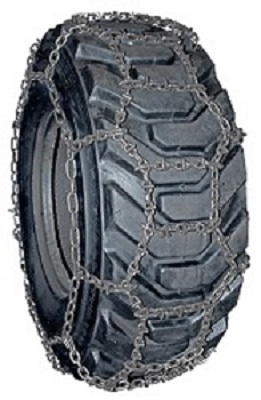 We offer three different styles of chains depending on the sort of terrain and tires they will be used on. The information below should help you make the determination of the best fit chain for your purpose. 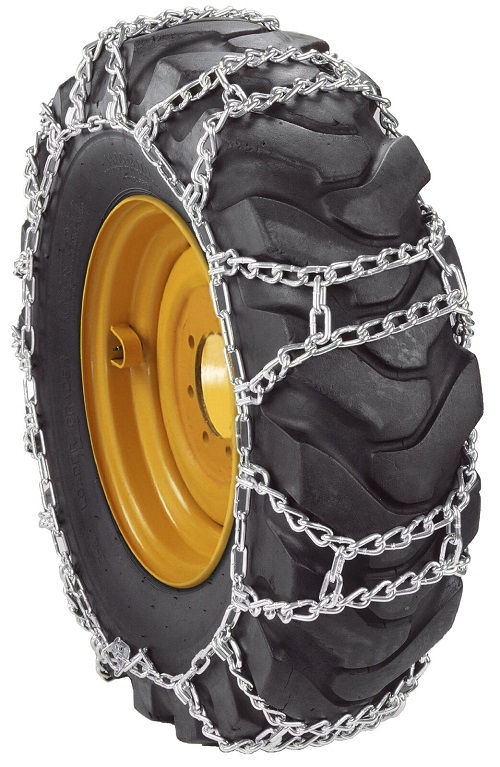 Double Ring Tractor Tire Chains are usually the least expensive option amongst all tractor tire chains and still offer great traction in icy conditions. Their self-cleaning rings make them ideal for both frozen and muddy thaw conditions. 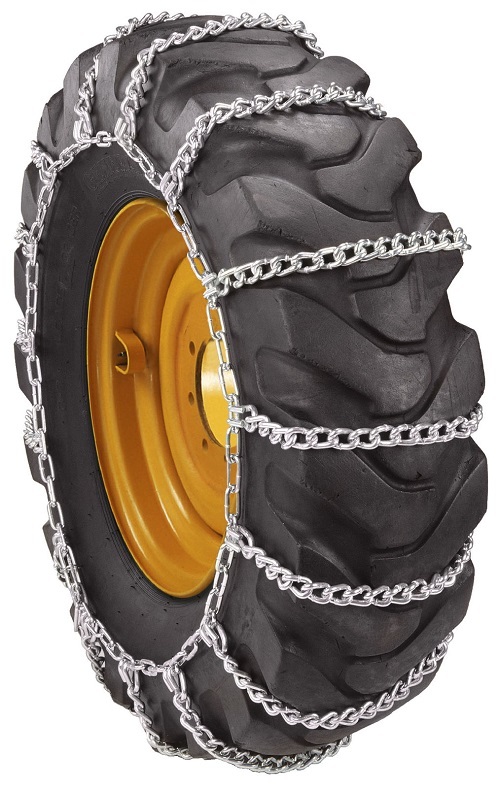 Duo Tractor Tire Chains are for off-road use only. 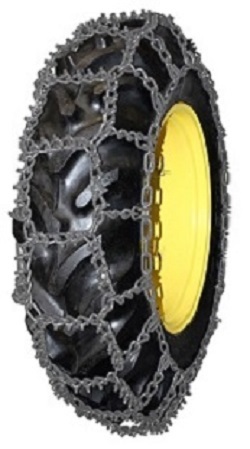 H-Pattern cross chains are the most popular type of tractor tire chain we sell. Their design enables the chains to sit on top of the lugs rather than fall inside the tread. This provides more chain contact with the ground which ensures better traction. 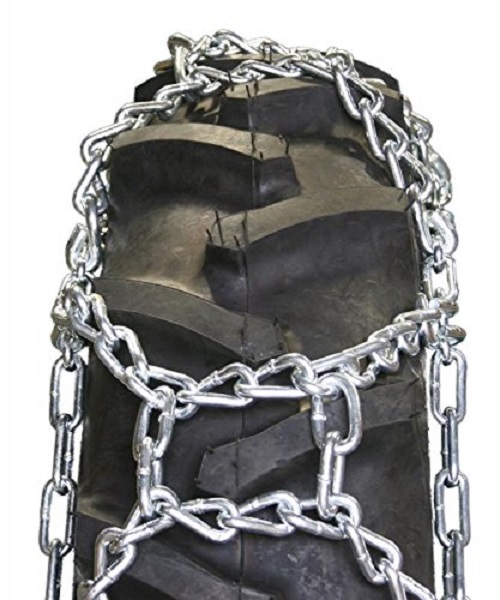 Ladder Tractor Tire Chains are sometimes branded as Road Master or Roadboss. They are designed more for hard surface or road use, and less for off-road, pasture or woodland driving. It is often far cheaper to repair chains than it is to buy brand new ones and for that purpose we carry a complete line of parts for all the tractor snow chains that we sell. This includes new cross chains, side chain fasteners, cross chain hooks and others. Our customer service agents can walk you through how to repair your existing set and what chain parts you'll need to complete the project. Give us a call at (866) 437-5883 to discuss your needs!